Danny Stockwell as Valjean, Craig Benson as Javert. Les Miserables, the musical now on stage at North Coast Repertory Theatre in Eureka, opened on Broadway with expensive grandeur. In his 1987 review, New York Times critic Frank Rich noted the revolving stage and the prodigious lighting and stage effects that included tilting towers and a floor that peeled back "to create the illusion of a sprawling, multilayered Paris on the brink of upheaval." This is the show that dazzled audiences for more than 6,000 performances and led to the sumptuous 2012 Hollywood film version. North Coast Rep performs it on a stationary stage with a single abstract set. No props much bigger than tables and chairs get moved around to set the scenes. Yet this production is impressive and effective, as its focus rests almost entirely on performing the music and the story. The story is set in the early 19th century, based on the enormous novel by Victor Hugo, who was something of a French Charles Dickens. Hugo dramatized the lives of the poor and the effects of society's injustices. He also reached a popular audience, as Dickens did, with extreme and memorable characters, rich historical context, occasional horror and forthright sentimentality. These themes and qualities, if not all of the plot twists, are in the musical as well. The NCRT production has assembled a stellar cast. 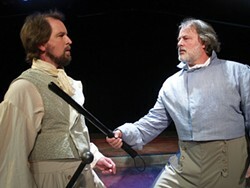 In a rare local stage appearance, Dan Stockwell exhibits a notable vocal range as Jean Valjean, the central character. Craig Benson is commanding as his antagonist, Inspector Javert. Greta Stockwell is a sympathetic Fantine, Nanette Voss-Herlihy a sparkling Cosette. As Cosette's lover, Jordan Dobbins deftly manages his transformation from a love-struck student to a wiser and stronger young man. Perhaps accentuated by the lack of stage artifice, the central figures don't dominate dramatically — the secondary characters have equally important moments. As the nefarious Thénardiers, Andrea Zvaleko and Tiggerbouncer Custodio provide darkly comic shenanigans. Luke Sikora has perhaps the most operatic singing part as the revolutionary leader Enjolras, which he performs with stirring effect. Some of the most thrilling vocal moments come from Jo Kuzelka as Eponine. They are only a few members of this skilled ensemble, which includes at least a half dozen actors and singers who've had principal roles in other local shows. A couple of relative newcomers exhibit precocious talent and stage presence that can't be taught: Sylvie Benson as young Cossette and Aiden Vergen as a confident, capering Gavroche. The efficiency of the production alone inspires admiration and the audience's confidence. In three hours of almost non-stop music, the coordination between the unseen 10-piece orchestra backstage and the singers and action on stage is virtually flawless. The orchestra itself is excellent. Angela Galioto-Marquez on violin and Kira Weiss on cello, in particular, produce heightened moments as singular as any of the singers. Under the direction of Elisabeth Harrington, the other players include Jonathan Webster, Levi Walls, Yuriah Lydon, Nicholas Durant, Leon Hamilton, Rebeca Ramos, Phil Sams, Melissa Gussin and Cody Forbes. The efficiency is also to the credit of director and stage designer Calder Johnson, and the quality of musical performance to music directors Harrington and Voss-Herlihy. With crisp diction, the singers make themselves understood. For the uninitiated, the music (by Claude-Michel Shonberg, lyrics by Herbert Kretzmer) blends classical and modern influences (Bizet, Kurt Weill) with pop. I've heard it described as "cheesy in a good way." Better than most '80s musicals, it has striking moments, and at worst it's transparent and inoffensive. Stage limitations do have consequences. With few specific visual cues, it akes a while to figure out where some scenes are set. Relatively colorless costuming that makes a meaningful point in the lavish, original production makes characters hard to identify from time to time in this one, especially since some actors play several roles. Without effects, it loses some dramatic power and the singing alone can't always maintain the illusion — at times the battle scene seems more like boys playing cowboys in the backyard. The lack of visual interest might also make the show seem longer. Serious devotees of this musical may notice that a few characters seem to have been cut or combined. But perhaps this paring down returns the show to its roots. It began as a concept album and a concert presentation in France, before producer Cameron Mackintosh (Cats, Phantom of the Opera) and the Royal Shakespeare Company turned it into a London-to-Broadway extravaganza. The NCRT production brings Les Miserables back to its essence and its origins, to the singers and the music. North Coast audiences may well be pleased and proud. Rae Robison designed costumes, Telfer Reynolds the lighting, Elizabeth Holverson the make-up, Laura Rhinehart the properties. Keili Simmons Marble is assistant director, and Kira Gallaway the stage manager, with Tyler Elwell backstage. Les Miserables is performed at NCRT weekends through June 21. 442-6278, www.ncrt.net. Members of Dell'Arte International School's graduating class of 2014 present The Finals: an evening of 10-minute plays as their final projects, May 29 through May 31 at 8 p.m. in the Carlo Theatre. Audience members are asked to make comments and give grades. 668-5663, www.dellarte.com.